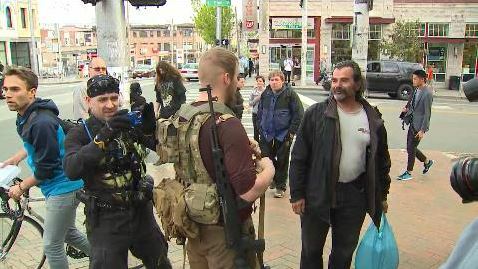 Amongst all the chaos in Seattle during Friday’s May Day riot, a man was seen walking through the crowd wearing a tactical vest with an SKS rifle slung over his shoulder. He says the chamber was empty, but there were rounds in the magazines. As the march wore on, protestors surrounded and intimidated him, chanting “WANNABE COP OUT”, while others were making the case that he had the right to be there. According to a blog called Andy Kaufman’s Kavalkade Krew, , the man walking the open carrier back has been identified as Martin Santiago.